Lawrence CR, East B, Rashid A, Tytherleigh-Strong GM. The prevalence of osteoarthritis of the sternoclavicular joint on computed tomography. J Shoulder Elbow Surg. 2017; 26:e18-e22. The shoulder girdle is comprised of 3 synovial joints with the sternoclavicular joint (SCJ) likely the least commonly involved (Figure 1). The authors acknowledged that the most common pathology of the SCJ is osteoarthritis (OA) as previously determined through cadaveric observation. Therefore, the dual purpose of this study was to determine if there was a similar pattern of OA severity and prevalence in the SCJ. The investigators retrospectively viewed CT scans from patients who underwent imaging for adjacent trauma or systemic pathologies such as cancer. None of the scans were ordered to evaluate the SCJ, but the image was reconstructed to use a minimum of 18 slices. This is significant because the scans were not ordered secondary to a painful SCJ. The authors acquired at least 20 patients in each decade of adult life. A total of 232 patients and 464 SCJ scans were used in the study. Definitive signs of OA were used to grade the joints including obvious presence of an osteophyte, subchondral cyst or cortical sclerosis. Each finding was given one point with the greatest severity receiving a score of 3 points per joint. Three separate reviewers reviewed the images to eliminate a deadlocked decision. OA was identified in 137 (59%) patients and 107 (46%) patients had bilateral involvement. Interestingly, a majority of the signs occurred on the clavicular side of the joint with less than 2% having isolated OA on the sternal side of the joint. The average age without any signs of OA was 41.4 years. Conversely, the average age for those patients with OA of the SCJ being 73.1 years of age. Eighty-nine percent of patients who were older than 70 years of age had at least 3 signs of OA in one joint. The presence of OA in the SCJ was not different between genders or hand dominance. Furthermore, there was an open physis in the younger patients between the ages of 20-25 years of age and an absence of OA. The presence of OA in the SCJ appears to be a normal degeneration of the joint beginning as early is the mid 30’s. By age 50, nearly 90% of individuals will have some sign of OA. It is also important to remember that OA could be a normal variant as none of these subjects were scanned for discomfort in the SCJ. According to the information from the authors, the SCJ is prone to typical degeneration especially as we age. It would be easy to consider this information as inconsequential, but this is beneficial for several reasons. It is important to remember that we do not treat imaging alone. Identifying OA in the SCJ coupled with the results from the examination would be more meaningful. If the SCJ is symptomatic, the IAOM advocates pain would be present in the C4 distribution1. It is also possible to see signs of degeneration such as osteophytes on the medial aspect of the clavicle with observation. Some authors have also advocated that a common characteristic of SCJ arthritis is a larger prominence with possible subtle anterior dislocation5.The basic examination includes an assessment of shoulder girdle motions. This may allow the clinician to compare sides for pain provocation or subtle hypomobility. Similarly, the capsular pattern for the SCJ is pain at the end of shoulder elevation requiring end range shoulder girdle motion to be evaluated as well. In summary, a cluster of pain in the C4 region, provocation or hypomobility with shoulder girdle motions, anteromedial clavicular prominence and pain at the end of shoulder elevation should warrant a local investigation of the SCJ. The IAOM advocates specific joint play testing to determine if the joint is hypermobile or hypomobile (Figure 2).to direct the appropriate intervention. If it is determined that the SCJ is a pain generator, traction mobilizations up to tissue resistance can be used for pain relief with acute injury (Figure 3). Figure 2. The examiner grasps the lateral aspect of the shoulder with the lateral clavicle. While stabilizing the thorax, the examiner will pull the right shoulder girdle in a direction of retraction. The examiner will simultaneously monitor the ipsilateral SCJ play with the index finger of the contralateral hand. Figure 3. To perform traction, the patient is positioned supine with a towel medial to the involved scapula to allow for slight retraction. Another towel is placed over the middle sternum of the patient prior to the clinician stabilizing the sternum with their forearm. Failure to stabilize the sternum will create a rocking or tipping of the trunk during the mobilization technique. Then the clinician will apply a traction up to tissue resistance for acute pain in the SCJ or a manipulative thrust through tissue resistance for a non-painful SCJ. The direction of force is in line with the clavicle. Moreover, a hypomobility may warrant joint specific mobilization (Figure 4) to improve mobility. The clinician may identify the hypomobility as part of an active arthritis in the SCJ. However, it may also be important to consider mobilizations through tissue resistance to improve end range limits with overhead elevation for pathologies such as external impingement3. In a study of 18-60 year old asymptomatic and symptomatic adults, the authors found that SCJ elevation and posterior rotation were decreased in the symptomatic population2. Identifying pain or limitations is important for the orthopedic manual physical therapist as there is evidence suggesting SCJ mobilizations can help decrease shoulder pain2,3. Furthermore, dysfunction in the SCJ may also warrant additional screening of the ACJ and scapular kinematics during humeral elevation2. Figure 4. Caudal glide of the SCJ can be performed to address end range shoulder girdle limitations identified in the SCJ. The clinician will first pre-position the shoulder at or near the end range humeral elevation (4a). The clinician will then orient themselves in a position lateral and inferior to the side being treated in a position ready to pull the clavicle in a caudal, ventral and slightly lateral direction (4b). 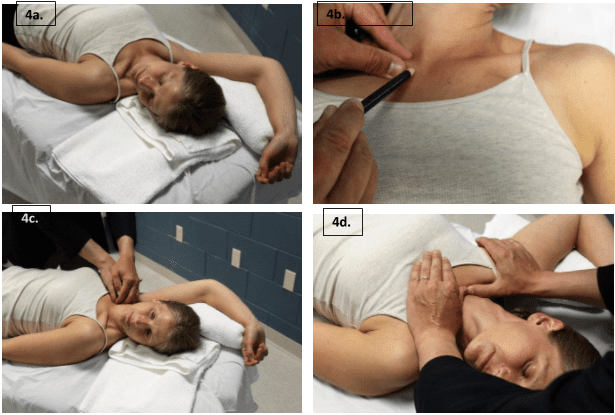 The examiner will position the head in ipsilateral sidebending and contralateral rotation to allow muscular relaxation and maximal purchase on the clavicle (4c). The opposite hand can be used to reinforce the mobilizing hand or to provide a more diffuse grip. An alternative position for the clinician is to push the clavicle in the same direction (4d) whereby the clinician will orient themselves in a position cranial to the involved SCJ. The direction of the mobilization is the same. In each scenario, the mobilization force will be performed to a point of tissue resistance. Hasset G, Barnsley L. Pain referral from the sternoclavicular joint: a study in normal volunteers. Rheumatology. 2001;40(8):859-62. Lawrence RL, Braman JP, LaPrade RF, Ludewig PM. (2014). Comparison of 3-Dimensional shoulder complex Kinematics in Individuals with and without shoulder pain, part I: SCJ, ACJ and STJ. JOSPT; 44(9):636-645. Mischke JJ, Emerson-Kavchak AJ, Courtney CA. Effect of sternoclavicular mobilization on pain and function in a patient with massive supraspinatus tear. Physiother Theory Pract. 2016;32(2):153-8. Van Tongel A, MacDonald P, Leiter J, Pouliart N, Peeler J. 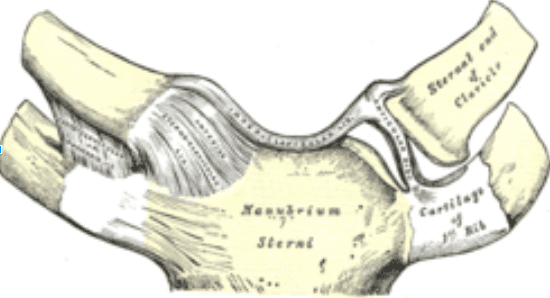 A cadaveric study of the structural anatomy of the sternoclavicular joint. Clin Anat. 2012;25(7):903-10. Van Tongel A, Valcke J, Piepers I, Verschueren T, DeWilde L. Relationship of the medial clavicular head to the manubrium in normal and symptomatic degenerated sternoclavicular joints. J Bone Joint Surg Am. 2014;96(13):e109.